Once your upload is fully complete, we copy it to our servers, then send it to Aframe&apos;s ingest farm and then the next available workers will start to transcode your footage. You can use the Processing page as a real-time tracker of when your footage will be available for viewing. Once your upload is complete, it will go green on the web upload interface, where it will drop to the bottom of the upload window, as shown below. Once it is picked up by a transcode worker, you will then notice, on the Media menu of the project, two indicators. The first is a yellow &apos;New item&apos; indicator, which you can click to refresh the page. The second is a pulsating orb next to Processing, on your menu sidebar, alerting you that footage is transcoding. When you click on the Processing menu you will see a screen similar to below. 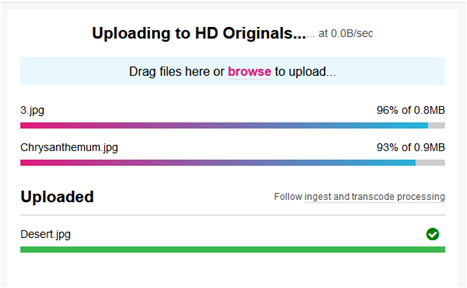 You can see here that the latest upload is starting to transcode, with the orange progress bar moving in a clockwise motion, once complete it will change to green. Your footage will then be ready for viewing. The SD version of the clip will always be done first, then the HD variant will follow (if available). You can click on the white triangle in the grey box to the right of screen to get the filename and extra info, as highlighted below. If you receive a red progress bar, as shown below, it means the transcode has failed. In this instance please let us know you have a transcode failure, along with the project name at cs@aframe.com. We may be able to resolve the failure by running it through alternative transcoders. Note: If there is a huge amount of media going through the ingest process, your media may be queing as it waits for a worker to pick it up. Once your upload is complete, you should see an activity item to confirm this in the &apos;Activity&apos; menu on your black menu sidebar, regardless of being picked up to transcode. If you do not see it picked up straight away, it will be queuing but feel free to get in touch and we can confirm this (and also give it a push if its urgent).